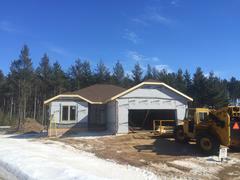 4340 Sterling Drive Plover- Home is Completed and Ready to Move In! Located in our Auburn Ridge Subdivision 1 1/2 Story. Vaulted Great Room with Gas Fireplace. Open Stairway. 2 Story Ceiling. 9 Foot Ceilings on Main Floor. Loft Area overlooks Great Room. Custom Kitchen with Island, Walk-In Pantry, 2 Tone Cabinetry & Granite. Main Floor Laundry/Mud Room with Locker Kids Drop Zone. Main Floor Master Suite with Walk-In Closet & Master Bath with Dual Sinks and Walk in Shower. Triple Stall Garage. Upper Level Features 3 Bedrooms all with Walk-In Closets. Lower Level Family Room, 4th Bath, and 5th Bedroom/Den/Office/Exercise Room. Painted Solid Core Doors and Trim. Landscaped with Sprinkers, Concrete Driveway, Deck, Matching Subdivision Light Post and Mailbox. Ready to move in! $324,900. Open House 12:15 to 1:15.